Published in a limited edition of 38 copies, DANCING WITH AMELIA combines biographical information about Amelia Earhart with romantic fiction based on the relationship that grew between Amelia and her husband, George Palmer Putnam. On the morning of her wedding day in 1931, Amelia wrote a letter to her soon-to-be husband. It revealed little enthusiasm for the marriage. She felt marriage would hinder her career, that it would interfere with her independence and that she'd still need to keep a separate apartment. Finally, she said, she must extract a terrible promise: "If we do not find happiness in a year you must give me my freedom." For the 1930's it was an amazing and outrageous letter. Equally amazing was that George agreed to its terms and that the wedding took place later that day. AND they remained married the rest of her life - another six years, until she perished attempting to fly around the world in 1938. So what did he do each year that kept her married to him? 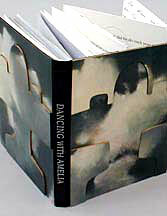 In DANCING WITH AMELIA, a fictional answer to that question has been written for each of the six years of their marriage. Following an introductory biographical sketch the fictional answers have been printed on the pages cut in the shape of an airplane. 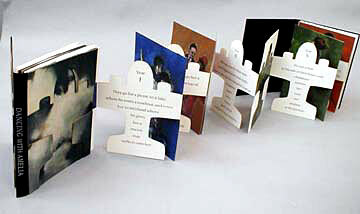 Images of the couples dancing have been printed with each of the fictional answers to support the notion that their relationship was like a dance. Their relationship was framed and obscured by the airplane - just as in the book cutouts obscure the images of the dancers. But if you reverse the accordian you can see completely the fine partners they made for each other. 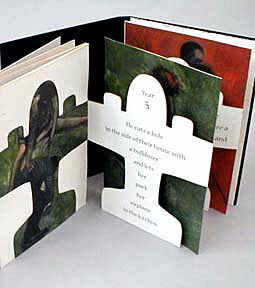 Edition of 38 copies with six short fictions and twelve Iris prints taken from six mixed media drawing of dancing couples by Charles Hobson. 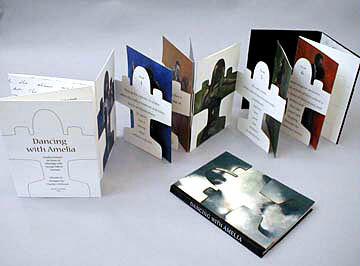 The cover is constructed of laser cut boards printed with cut out images of contrasting clouds and the book is protected by a cloth covered chemise. 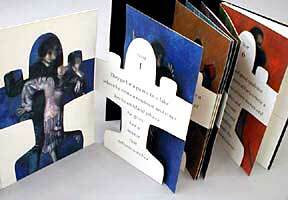 It contains 36 pages and measures 6 1/4 x 8 1/2 inches when closed and extends to a length of seven feet. Out of Print.